After a very long period of extremely dry weather with high humidity and scorching hot days, it rained here yesterday. We needed the rain for the grass, plants and trees. I sit on the fence when it comes to rainy days. I like them and I dislike them, but one good thing about a rainy day is I can be very productive – no pull from the sunny day to put things aside and come out and enjoy it. A rainy day is a great day for making preserves. I was given a box full of green tomatoes on Sunday, so yesterday afternoon’s agenda was to make something with them. 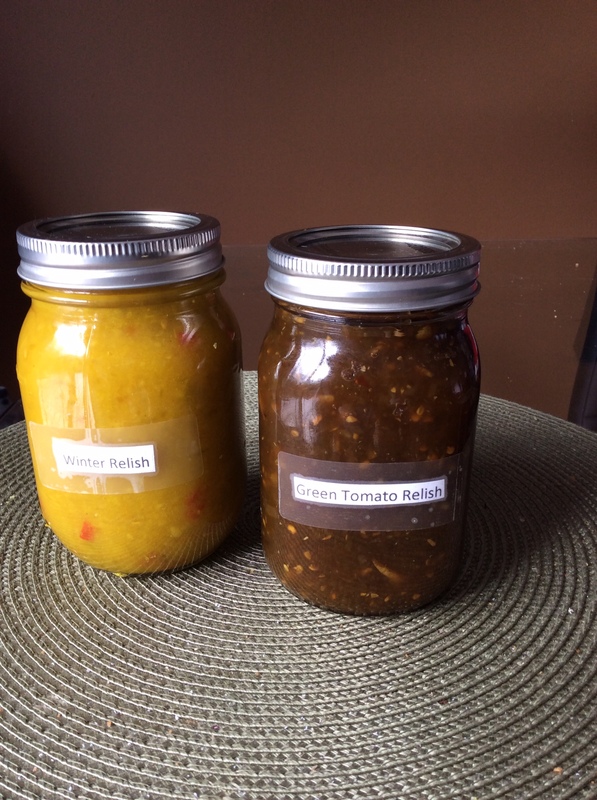 I made 2 different kinds of relish. The recipe for one is below. When you read the recipe you may scrunch your nose and say “Nope, not gonna try this.” Let me tell you, this relish gets rave reviews and I had requests for bottles of it this year. Place vegetables in a large saucepan and add remaining ingredients. Bring to a boil, reduce to simmer, cook uncovered until golden brown and quite thick, 1-2 hours. Place in clean, sterilized jars and can, allowing jars 10 minutes to boil in the canner. Alternatively, freeze in plastic bags. You can see the color of the relish in the picture above. The bottle sitting beside it is the other type of relish I made yesterday. This brings my relish list to three kinds this fall. You will find the recipe for the cucumber relish I made a couple of weeks ago in a previous post. I have not posted the recipe for the Winter relish in this photo.